We use Google every day for everything or almost everything. But have you ever have that moment where no matter what phrase you type into the search box, no matter how deep you dig into the result page, you just can’t get what you’re looking for? If your answer is yes, perhaps you need some tips on how to search. 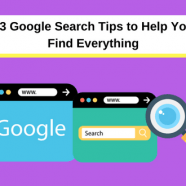 So here are 13 Google search tips to help you find anything and everything across the web. Use the – operator to exclude the term from appearing in result. This is especially useful for terms that are used in pop culture. In my example, if you search for “stitch” without the minus operator you’ll probably be greeted by a blue alien pet dog from Disney. You can also use a + sign if you want the result to include another term. If your search term is made up of more than one word, the results might not be accurate because the search engine returns results where the terms appear separately. So use quotation marks to get results with the exact math. Use the OR (yes, in capital letters) when you want to combine search queries. This is useful in a situation where you’re looking for two terms that are similar in nature. I use this when I want to treat the targeted term as a theme, and have the result include whatever that comes along with it. When you need to search on a site but their own search function is ineffective, consider using Google instead. Instead of typing out “from 1994 to 2001” you can simply replace it with two dots, like this “1994..2001” and you’ll get results between those numbers. Use this operator to search specifically in the title, and use quotes when your term is made up of more than a word. Use this operator to search specifically in the title, but using all the words in your search term. Use this operator to search specifically in the body, and use quotes when your term is made up of more than a word. Use this operator to search specifically in the body, but using all the words in your search term. While searching for more technical or scholastic terms there are often search results that trigger a pdf download when clicked. The filetype operator can be used to specify the filetype you want to avoid such a problem. Use this to look for similar or related sites for the site you want. It only works on bigger websites though. Other than searching for information, Google can also show you some handy tools. Can’t decide on having fried chicken or pizza? What not ask Google to flip a coin to decide? Heads for some fried chicken, tails for a box of pizza. I’m not sure on what occasion you need to roll a dice other than during a game. But in case you need to roll a dice without a dice on hand, Google got you covered. 3. 1 + 1= ? Have a math question? Type that into the Google search bar and you’ll get your answer. Handy when you don’t have a calculator on hand. Not sure what that hot French model mean by bisous? Try typing bisous in English in the search bar, and you’ll get your translation in a millisecond. How many miles is a kilometer? How many millimeters is a gallon? As long as the metric and imperial system still lives side by side, you can rely on Google when you need a little conversion. Other than length or volume, Google can also convert your currencies. Just type in any of the variations for 50 USD in CAD and you’ll get your conversion window at the result page. Type in the search bar “countdown 5 minutes” and Google will start counting down using their timer and stopwatch. Type in the word weather followed with the name of the city or if you have a postcode and you’ll know whether you need to take the umbrella out. Now we know Google search can help you find whatever you want, provide you with some handy tools, what about using search to have some fun? With the world cup running now, you can access all the scores and schedules of the event by simply searching for soccer or football if youre English. Let the search engine show you in action what askew is. Need to kill some time? Play a game of Zerg Rush on your Google result page and click your way through the little o before they clear off your screen. Type in either do a barrel roll or “z or r twice” and get ready for a second of motion sickness. If you need to kill some time and have some fun, but the only website you can access is Google. Go into their image tab and type in Atari Breakout for some good old arcade game. Ever wonder how Google looks like 20 years ago? Search for Google in 1998 will literally bring you to Google in 1998.